In a nonstick saute pan, add olive oil and flattened chicken tenderloins; cook chicken until lightly browned. 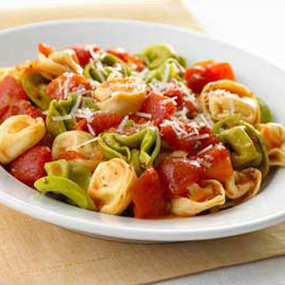 Add Furmano's Italian Style Diced Tomatoes with Basil, Garlic & Oregano, garlic, olives and red wine. Simmer covered for 10 minutes until almost all the liquid has evaporated. While the chicken is cooking, cut eggplant in 1/8 inch slices and place in boiling salted water for 10 minutes. On dinner plates, place a bed of cooked eggplant, then place the chicken tomato mixture on top.